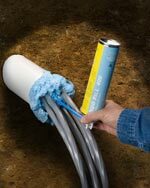 A two-part polyurethane foam sealant that comes in a can and features a long dispensing tube that reaches deep inside conduits and holes is being introduced by Todol Products, Inc. of Natick, Mass. Todol Duo-Fill 400 Two-Part Urethane Foam Sealant is designed for plugging and sealing applications where rapid expansion and fast curing are required to quickly stop flowing water. Packaged in a “can-inside-a-can” for field use, this expanding closed-cell foam sealant mixes directly in the actuator head of the rigid 9-inch L dispensing tube. The sealant adheres well to most construction materials and offers multiple starts and closures. The 13 oz. two-part can-inside-a-can dynamically expands to 3.5 gals of foam sealant.